We specialize in working with children to make them feel at ease and determine what is the best plan for their vision. We use special eyecharts for children who are too young to read. We measure their tracking ability, ocular alignment, color vision and depth perception among many other tests. If children do need glasses we have frames made just the right size for them. We don’t try to make oversized adult frames fit them. 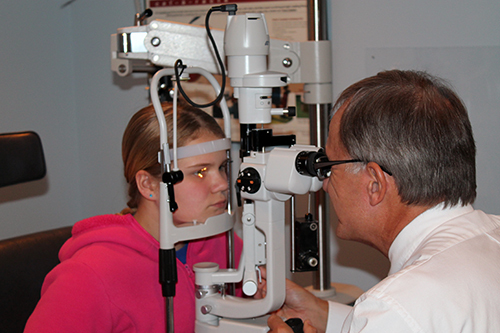 A child’s eye exam at our office is a painless fun experience. Most children are fascinated by all of our instruments and when they find out that it doesn’t hurt they are eager to come back for their next visit. Annual eye examinations are extremely important for children because as they grow their vision can change dramatically in as little as a year’s time. And very rarely do children complain about their vision, because often they believe the way they see is the way everyone else sees. School screening while important are not eye exams and often miss a significant percentage of eye problems in children. These problems include near sightedness, farsightedness, astigmatism, turned eye, lazy eye. The earlier these problems are diagnosed and treated the better is the result. That is the reason that an annual eye examination is necessary for children.